In his tenure as a political commentary writer, he has made a significant impact. His feature articles have appeared in the Piedmont Post, the San Francisco Chronicle, Human Events, and Townhall Magazine. Two of his articles were featured on the cover of Townhall Magazine. He wrote an Op-ed which appeared in the liberal San Francisco Chronicle a month before Obama was inaugurated entitled, A Second New Deal is a Recipe for Disaster. Two and half years later, on August 6, 2011, the Chronicle ran the front-page headline–S&P Downgrades U.S. Credit Rating. The result of ten years of research, his book, Lessons from Fallen Civilizations, contains the answers the above questions he asked in the wake of 9/11. His book has already received critical praise as a saga which begins on the plane of Marathon in 490 BC and whose main character is Western Civilization. Larry Kelley is currently a marketing consultant to technology companies, a freelance writer, and one who’d whimsically be self-described as a former adventurer, not to mention an early developer of the modern skateboard. In the late 70s, he attended the University of California at Santa Barbara and earned a B.A. in English Literature. 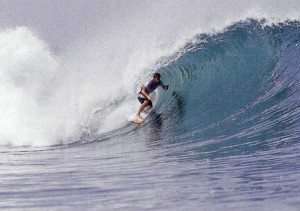 In between readings of Milton, Keats, Wordsworth, and Jack Kerouac, he took up surfing and adopted the resident neo beat-generation surfing subculture of Isla Vista, that off-campus “youth ghetto” overlooking the Pacific. Reminiscent of the narrator in Kerouac’s On the Road, soon after graduation and with practically no money, Kelley embarked on several solo, madcap, endless-summer, surfing explorations beginning with sojourns at the international surfing Mecca of Biarritz, France, and including Lisbon, Tangiers, Casablanca as well as other unnamed, hang-outs and breaks in southern Morocco and the Spanish Sahara. 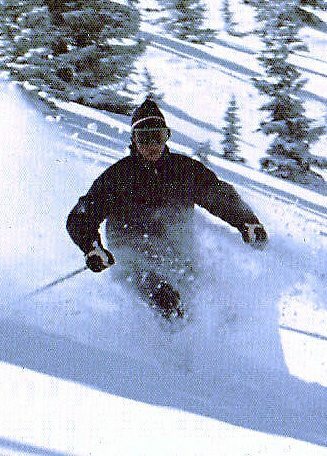 After a surf trip to the Caribbean and Central America, Kelley moved to Vail Colorado to ski and write on his first novel. 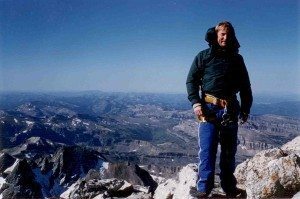 Kelley has climbed the five tallest peaks in the lower 48 states including the Grand Tetons (see photos of the range in the above banner and the author on the summit to the left). Today Kelley’s interest (some would say obsession) is in commenting on how our creeping collectivization threatens Western Civilization. 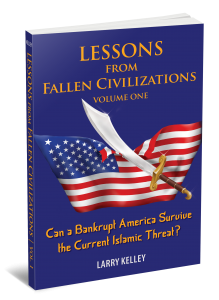 Volume One: Can a Bankrupt America Survive the Current Islamic Threat? Volume One goes deep into history to examine the fall of great civilizations like Greece, Carthage and Rome. Through this, Larry Kelley outlines 10 factors, or Immutable Laws, that have repeatedly led to the destruction of these civilizations. Learn how they relate to the modern Islamic threat. 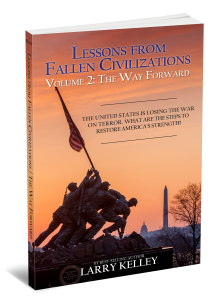 Volume Two dives into modern day losses the West has suffered at the hands of resurgent militant Islam, the consequent dangers America faces due to the failures of the Obama presidency, and what future American presidents and the US allies must do about it. Larry Kelley offers an additional Immutable Law and a 12-step plan to beat resurgent militant Islam and create a safe future. Yes, it’s possible!